Flights are one of the biggest expenses on any international trip and depending on the location your are flying to, it could be roughly half of the total budget for the trip. That’s why finding cheap flight tickets is worth putting in a bit of an extra effort into. It’s not difficult to find good deals on international flights and these tips will help you find out the cheapest flight tickets out there. Before you begin looking for cheapest international flights, there are a few things you should know. When planning your trip, you ideally should avoid going to any destination during peak travel season. If you want to go to Europe in August, fares are going to be expensive across the board and you’ll be very lucky to find a reasonably priced flight. Next, if you are looking for the best flight deals, you will also need to be flexible with your travel dates and destinations. Sometimes moving your travel dates by a couple of days can get you a much better deal. You should also be open to travelling to and from nearby airports. For instance, in Europe you could take a cheaper flight to Amsterdam instead of going directly to Prague and then book another flight to your destination or go by road. However, it may not work in India if you have to fly to Delhi before catching a flight out of the country. The busier the airport, the better the chance of finding cheap flight ticket. As is evident, it is possible to find a good deal but it also involves some inconveniences. It’s up to you to decide if the trade-off is worth the cost difference. Another good tip is to sign up for frequent flyer programmes with airlines. For international trips, you’ll end up gaining a lot of miles on a roundtrip and this will eventually lead to lots of perks such as free flights, ticket upgrades, priority boarding, a higher baggage limits, and much more, some of which can compensate even if you don’t necessarily find the cheapest flight tickets. We’d also suggest that you don’t bother with clearing cookies or using private browsing modes while looking for flights. These methods aren’t likely to find you cheaper fares, based on reports on multiple websites. You may try to use a VPN to get a cheaper fare (sometimes airlines offer lower rates in some currencies), but this method involves too much hassle for most people. Also, last-minute deals are a myth. Hardly any airlines offer lower rates if you book a ticket at the last-minute — most of those fares are raised to make business travellers pay more. With that out of the way, here’s how you can find good deals on international flights. Flight search engines are your best friend if you are looking for good deals. We’re listing the ones that are worth checking out, with their unique features described in a sentence. Google Flights: Google Flights is perhaps the fastest way to look at flight prices across the world. The interface is nice and you get results fast. 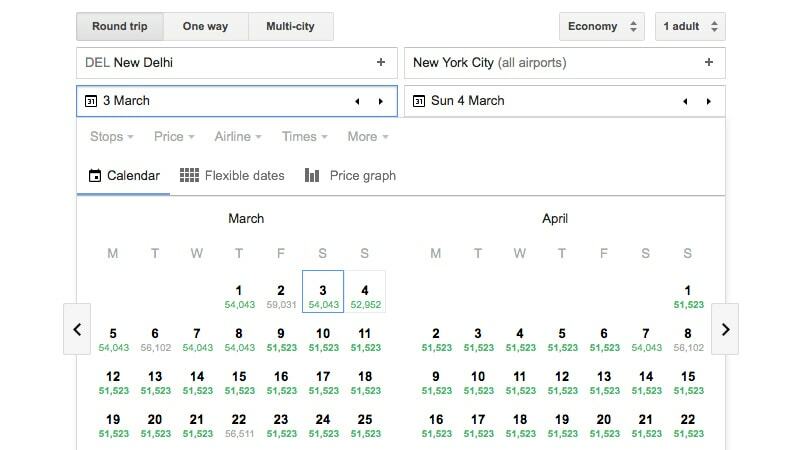 ITA Matrix: This service is owned by Google and it powers Google Flights. However, if you want additional search options such as allowing airport changes and are willing to wait longer for results to load, ITA Matrix is quite good. Skyscanner: Skyscanner is a popular flight ticket price comparison website. 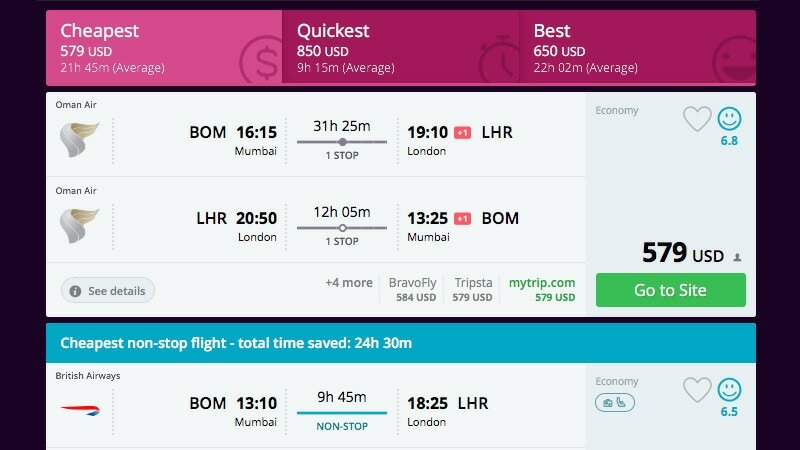 It has a neat interface, shows results reasonably fast, lets you set price alerts so you don’t miss out on the cheapest flight tickets and is available via smartphone apps too. Momondo: Momondo is also pretty good at finding the cheapest possible flight and it rates each result on a scale of 10. The higher the score, the better the flight’s duration to price ratio. You don’t want to be taking a 31-hour flight (normal time 10 hours) to the UK to save Rs. 2,500 on a return flight. Priceline: Priceline is another good flight search engine with a neat sidebar that shows the lowest fare on each airline to quickly help you see which of your favourite airlines offer the cheapest flight tickets at the moment. Kiwi: Kiwi.com sometimes offers lower fares than any other search engine, and is worth checking once before booking your ticket. These methods put the onus of doing all the work on you, but if you don’t want that, you can always use some services that find you the cheapest flights out there. We found a bunch of services that inform you via email about really good flight deals. The ones we’re listing rely on subscription money to keep their business running, which means that they focus on finding great deals and not flights that will get them the best commission. Once again, these services will send you alerts based on your region, so if you specify that you want alerts for flights originating from Asia, you will get emails for flights only from that region. As long as you’re flexible with your schedule and the destination airport, these services can be extremely useful. If you have a US tourist visa that’s valid for 10 years and you want to visit the country at any point this year, this kind of a service could alert you about great deals and you can then plan your trip accordingly. We recently saw a roundtrip flight from Colombo to Milan for Rs. 20,000, among other deals via some of these services. Scott’s Cheap Flights: They email you flight deals from your region. The free tier has some ads sent via email and you get fewer deals, also around 30 minutes after the premium tier. A premium subscription costs $39 (roughly Rs. 2,500) per year. This service shared more Asia-based deals than others we tried, so it may be better suited for Indians. Flystein: Looking for more personalised advice? Flystein will help you find the cheapest flights for any given travel dates. You tell them your destination and the dates, and their team will find the cheapest possible alternative. The catch is that this service charges per request, so you’re looking at a $49 (roughly Rs. 3,150) for every roundtrip or multi-city itinerary you want flight deals for. We also came across a bunch of other services such as Get Me To Europe and I Want That Flight, which may serve your needs better if you’re looking for cheapest flight tickets for a US-Europe trip or if you’re based in Australia. Hidden-city ticketing is a risky practice that can sometimes find you the lowest possible fare at the cost of an extra stop or two in your journey. The easiest way to explain this term is via an example. If you want to go from Mumbai to Delhi, sometimes the cheapest flight may be a Mumbai-Lucknow flight that stops at Delhi. Hidden-city ticketing is when you book that Mumbai-Lucknow flight and exit the airport at Delhi. This will only work if you have cabin baggage only because checked baggage will go all the way to the last leg of the journey. We don’t recommend trying this unless you’re desperately short on cash. Be aware that airlines frown upon this practice and they may ban you from flying or take away your frequent flyer privileges. If you’re fine with the risks, sites such as Skiplagged help you find the best of such deals. 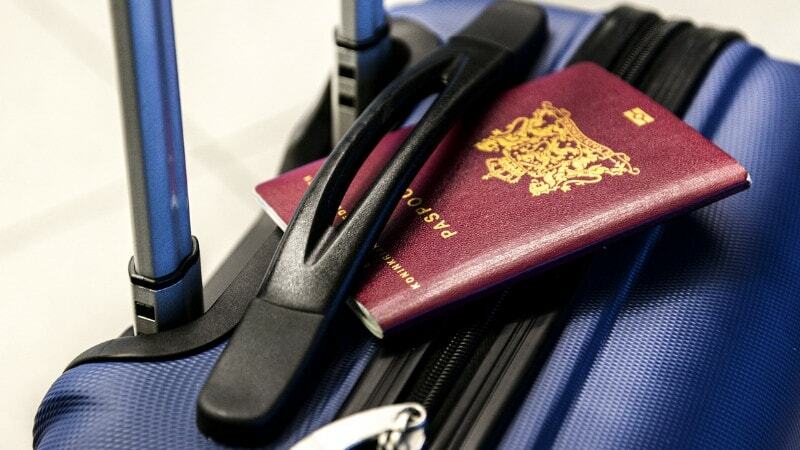 Which are your favourite tips for finding cheap flight tickets? Let us know via the comments.